I Want A Bender Built Pond! What's the CO$T? Please contact us for your FREE design consultation! We can help you decide the best water feature to suit your personal tastes. We build ponds with waterfalls; pondless waterfalls; water gardens; rock gardens; as well as adding finishing touches to your existing yard and gardens to make your home-life more enjoyable and as low-maintenance as possible so you have time to relax to the soothing sounds and sights a water feature offers. We are located in Sacramento, CA. As a family owned business we work from our home. This saves our customers the costs of running a storefront. We do not mark up our products/materials the 25%-50% like most contractors do. 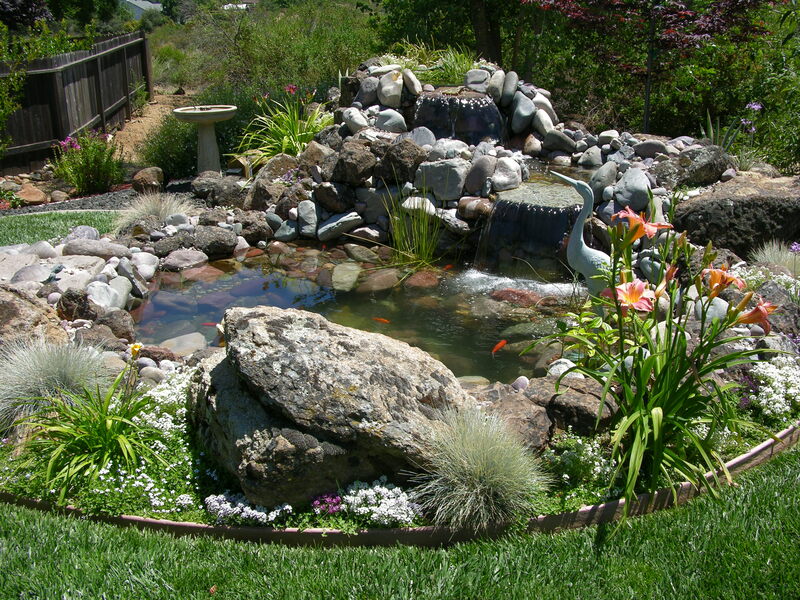 Do you already have a pond or waterfall that you are not happy with or needs rebuilding? We are willing to re-use parts that are still in good working order to help cut costs. We invite your calls or e-mails. We are it! No employees, storefront or added overhead.When we say we can do it - it's because we do it! Our prices are based on costs/parts and labor only.AND WE WARRANTY OUR WORKMANSHIP!